We are located on Greenhill Road between Goodwood Road and Anzac Highway. Visitor parking can be found underneath the building. 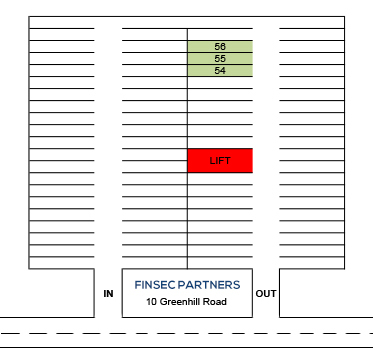 Spaces reserved for FinSec clients are parks 54, 55 and 56 (please see the below map). If coming from an Easterly direction on Greenhill Road — turn left into Hamilton Boulevard (formerly Johnstone Terrace) to park. If coming from a Westerly direction on Greenhill Road — coming off Anzac Highway or Richmond Road, travel along Greenhill Road past the office and use the second break in the median strip to perform a U-turn (adjacent SA Lotteries). Continue along Greenhill Road in a Westerly direction, turn left into Hamilton Boulevard (formerly Johnstone Terrace) to park and make your way by foot to the building entrance in Greenhill Road. In addition to Hamilton Boulevard, Rose Terrace and Cooke Terrace, parking is also available on Greenhill Road (10am — 3pm). Please use the front entrance on Greenhill Road. The FinSec office is on level one and accessible via stairs or lift. The office is conveniently located close to both train and bus public transport services.